The influence of climate on human beings manifests itself in a variety of fashions, primarily through man’s thermal state governed by external effects as well as by internal physiological processes. A comfortable perception of heat occurs when the input of heat and the thermal discharge in human body are in equilibrium. With an intensification of heat or cold, there is an increase in the tension of the physiological systems, which ensures this equilibrium. The intensity and duration of the impact from significant environmental parameters are responsible for the level of expenditures connected with the attainment of physiological comfort of the human life. The number of days with normal-equivalent-effective temperature (NEET) above 8 °C is said to characterize indirectly the degree of comfort of a warm period for sensibly dressed people. The duration of periods with daily mean air temperatures below −25 °C and the sums above 10 °C represent the territory’s resources of heat and cold. The contrasts of the frost-free period determine the need for and the reliability of covering materials used in vegetable farming. In addition, a combination of low temperatures with wind velocity acts to enhance heat output from open surfaces of human body. The risk of cold weather injuries when the values of reduced temperatures are below −32 °C serves as a forewarning in the case of arranging recreation and working in the open air [Khairullin and Karpenko, 2005]. The duration of the heating period makes it possible to calculate the future expenditures of heat necessary for heating various premises. The spatial differentiation of the indices under consideration is important within the confines of the basin [Scientific-applied…, 1989, 1991; http://www.meteo.ru]. The mean daily temperature in the high mountains does not reach 10 °C, and its sum varies from 2400 °С in the southern part of the basin to 500 °С along the northeastern shores of Lake Baikal. The mean monthly NEET do not reach 8 °C in separate sections of the shores of Khovsgol and Baikal, and across the remaining territory they vary from 40 to 110 days. The frost-free period varies between 0 to 110 days. The smallest spatial fluctuations correspond to the duration of the heating season (230−305 days). The number of days with the mean daily air temperature below −25 °C is largest in the bottoms of closed depressions and valleys of the western part of the basin. With the wind factor taken into account, the differentiation of the severity of climate is enhanced. The mean values of reduced January temperature drop below −37 °C in Tosontsengel and Khatgal. In the former case, this is due to low air temperatures, whereas the increased wind activity is responsible for this in the latter case. The combined effect of climatic resources has a substantial influence upon the aggregate volume of expenditures connected with the provision of physiological comfort for humans and the manufacture of products. The background characteristic features of the combined effect of the meteoparameters under consideration on humans and of their duration upon the degree of discomfort of habitation were revealed by using the resource-assessment approach [Bashalkhanova et al., 2012]. Throughout most of the basin’s territory the level of climatic discomfort is moderate, whereas it is strong on the northern, northwestern and western margins. The circle diagrams show the volume of the most differentiated parameters of climatic discomfort. The vertical axis is graduated in points from 1 to 5, and reflects the conditions of warm and cold periods. The diagrams corresponding to the most contrasting locations display the leading attributes of climatic discomfort of these territories. A strong level of discomfort in the northern and western parts of the basin is due largely to the preceding low air temperatures, while on the shores of Khovsgol and in Tariat it is, to a larger extent, caused by a low heat availability in the summertime and, in the aggregate, by increased wind activity. The life of the population on such territories is more expensive and involves a limitation of the kinds of economic activities, shorter periods of stay in the open air, the requirement for a higher energy value of food, heat insulation of clothes and rooms, and a necessitous adjustment of production technologies, equipment and systems to low temperatures. On the other territory, the total duration of impacts of the parameters under consideration lies within moderate limits. The low duration of the period with NEET <5 °C (within 40−70 days) in the middle mountains is compensated by favorable winter conditions. Bashalkhanova, L.B., Veselova, V.N. and Korytny, L.M., (2012). 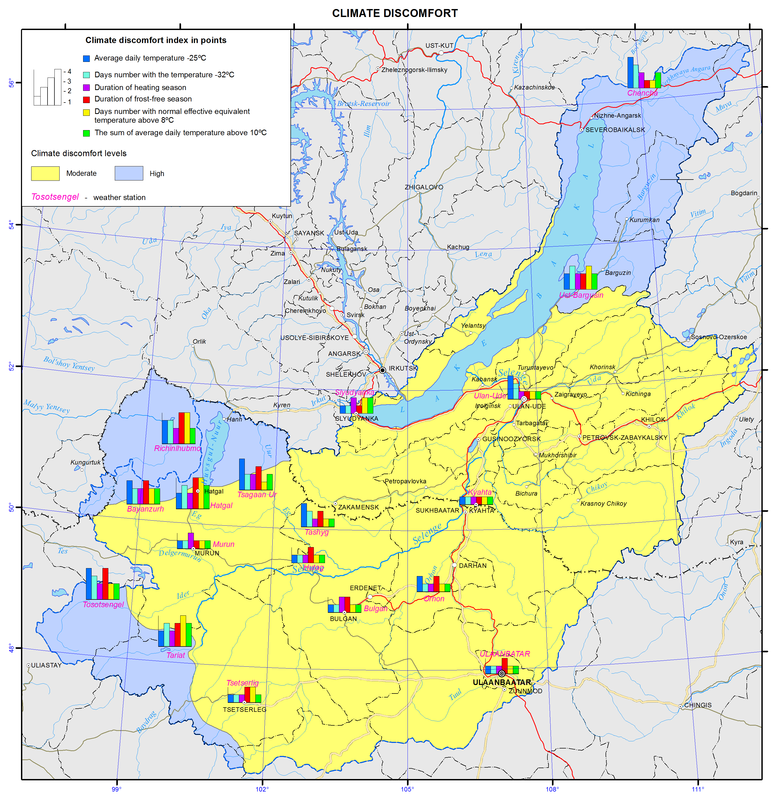 Resource Dimension of Social Conditions for the Life of the Population of East Siberia, Novosibirsk: Geo, 221 p.
Scientific-Applied Handbook on the USSR Climate. Ser. 3, Long-Term Data, Parts 1−6, (1989). Leningrad: Gidrometeoizdat, 1991, issue 22, 604 p.;, issue 23, 550 p.